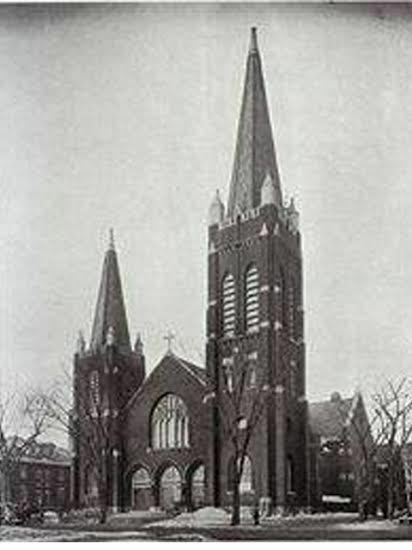 Located north of 17th Avenue between Dupont and Bryant Avenues, Ascension Church has played a major role in the life of Old Highland since 1890, when the original church was built as a spiritual home for the many Catholic immigrants settling in the neighborhood. The first priest, Father Alexander Christie, purchased the original four lots, which included a house that became the rectory, and began construction of the first church building. 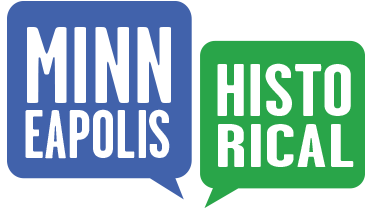 Father Christie only served the parish for three years--his staunch attitude towards banning alcohol made him unpopular with his largely German and Irish Catholic parishioners--but his accomplishments laid the groundwork for what became, during its heyday, one of the largest and most active parishes in the city of Minneapolis. 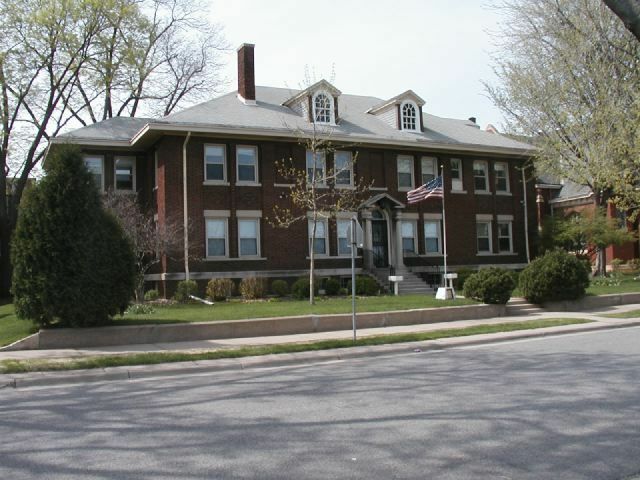 In 1894, Father Jeremiah Harrington bought four more lots and built Ascension School, Ascension Club, and the current rectory, and established a convent, in order to continue to build the community of Catholics in the area. He then turned his attention to replacing the original church building, and the current structure was built in 1902 and dedicated by Archbishop John Ireland in 1903. The large, smooth red brick-and-sandstone Gothic church is visually a very imposing and dominating presence in the neighborhood. The rectory adjacent to the church was built 19 years later. The first floor includes the pastor's rooms, reception and dining rooms, and the parish office. E.J. Donahue of St. Paul designed Ascension Church, as well as the Church of the Holy Rosary in Graceville, MN. 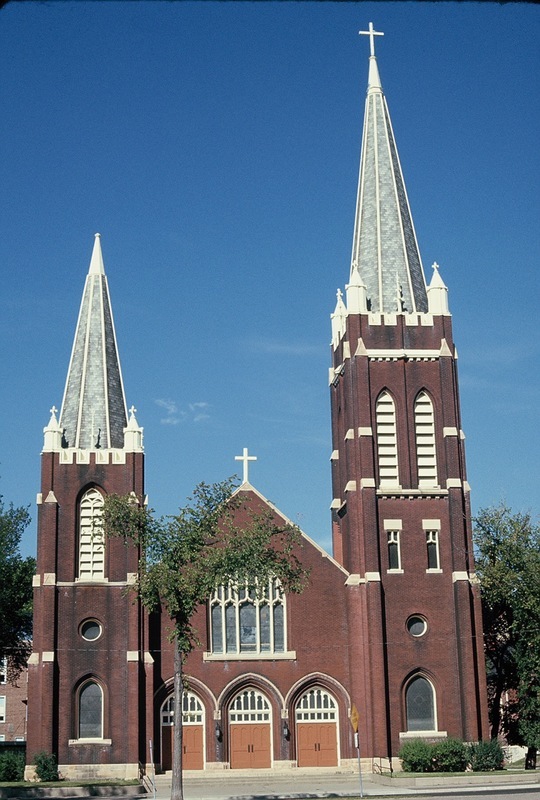 The church's steeply-pitched towers are done in a Gothic Revival style with red brick and sandstone, a cross-gabled roof, and elaborate stained glass. This structure is unique in the sheer variety of intact stained glass that still exists. Each of the large church towers has an arched stained-glass window with a circular stained-glass window above it. Note on both towers the pointed, arched openings with louvered wooden panels, battlement details at the end of each tower (suggesting militaristic defense), and pinnacles at each corner. Spires cap each tower. The central body of the church has three arched doorways with shaped windows above; a dominant stained-glass window extends into the gable. Note that the central window consists of separate arched windows, and the roof has a parapet (a low railing on the edge of the roof). The rectory, which is adjacent to the church, was built 19 years later in a Colonial Revival/Georgian style. 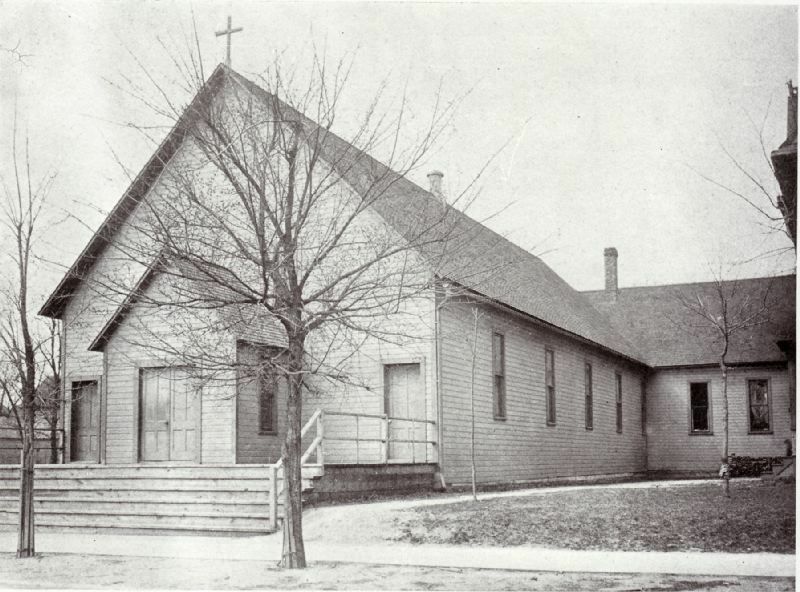 Old Highland Neighborhood Association, “1723 Bryant Avenue North: Church of the Ascension,” Minneapolis Historical, accessed April 22, 2019, http://minneapolishistorical.org/items/show/7.